Judith and Gerson right after their engagement. Image courtesy of The Leiber Collection. Penguins and polar bears, a watermelon slice, peppermint candy and stalks of asparagus—all have been sources of inspiration for designer Judith Leiber’s fanciful handbags. Meticulously handcrafted, often glittering with thousands of Swarovski crystals and shaped from metals, Lucite, seashells, textiles and leathers, Leiber’s creations transcend fashion: They are wearable works of art, featured in numerous permanent collections including the Smithsonian in Washington, D.C., and the Metropolitan Museum of Art in Manhattan. Two new exhibits showcase some of her 3,500 innovative clutches and purses. “Brilliant Partners: Judith Leiber’s Handbags & the Art of Gerson Leiber” at the Long Island Museum through June 4 pairs 130 handbags with over 50 modernist paintings, copper etchings and prints created over the years by her 95-year-old husband, Gerson Leiber. The Museum of Arts and Design in Manhattan takes a biographical approach in “Judith Leiber: Crafting a New York Story,” April 4 to September 17, told through 75 handbags. Many of the purses in both shows are on loan from The Leiber Collection in East Hampton, N.Y., a museum that the Leibers built to house their art (open to the public in the summer). The Long Island exhibition opens with the pink silk, rhinestone-studded bag that Mamie Eisenhower used at her husband’s 1953 presidential inauguration. Leiber was then top designer and patternmaker at Nettie Rosenstein, the Brooklyn-based designer who popularized the little black dress. The bag launched Leiber’s career; she went on to create bags for every First Lady from Eisenhower to Laura Bush as well as celebrities, including opera singer Beverly Sills and actress Sharon Stone. The Museum of Arts and Design displays two bags crafted for Hillary Clinton—one in the form of the Clintons’ black-and-white cat Socks and the other a clutch with a bold sunflower design. Though none of Leiber’s handbags sport any overtly Jewish symbols, her background is threaded into every stitch. Born Judith Peto in Budapest in 1921 in the shadow of anti-Semitism, she was sent as a teenager to London to study chemistry (Jews were barred from Hungarian universities). Leiber returned home for the summer of 1939—and World War II broke out. She decided to apprentice at the Jewish-owned Pessl handbag factory in Budapest, rising to become the only woman in Hungary to enter the handbag guild. Ball miniaudiere. Image courtesy of The Leiber Collection. Leiber’s resourcefulness also helped save her and her family from the Nazis. When her father was taken to a labor camp, she asked a contact in the Swiss consulate to issue a diplomatic pass to free him, and found a way to add the words “and family.” They survived the war hiding in a Swiss “protected house” in Budapest with 36 people in one room. 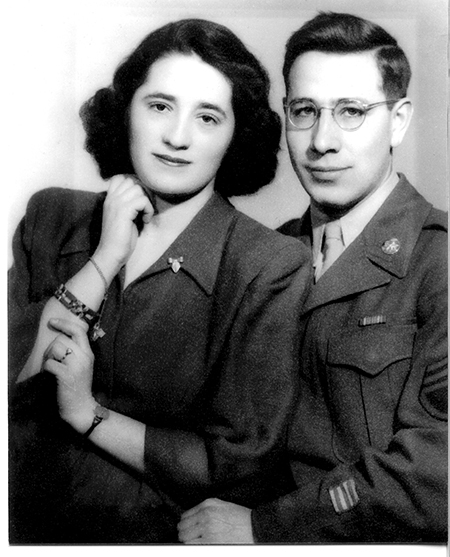 “To keep my sanity,” Leiber writes in an email interview, “I designed handbags in my head.” In 1944, the family was rounded up and moved to the ghetto, where they hid in cellars in the bitter cold. Venturing out after liberation, she met Gerson Leiber, a soldier in the United States Army. They married in 1946 and a year later moved to New York, where she found work at several handbag companies. The American assembly-line production was broken into specialties like cutters and patternmakers—very different from her start-to-finish Old World training. The Leibers began their own company with four employees; by the time they sold it in 1993, they employed 210 artisans. As Leiber built her business, suppliers offered her fabrics from Japan, India, Iran and Africa, says De Tillio. 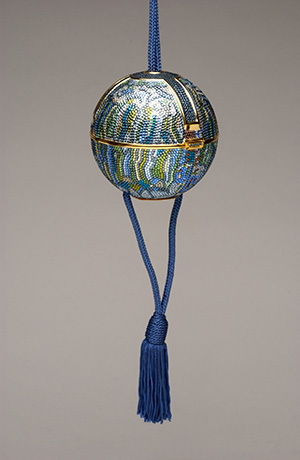 Leiber’s imaginative minaudières—small, colorful evening bags—began as a solution to a damaged metal frame. Leiber salvaged it by decorating it with crystals. Visitors to both exhibits can view versions of that original bag from 1967, a chatelaine purse in gold with rhinestones. Leiber turned everyday sources of inspiration into both whimsy and artistry. In the Long Island exhibit, a blue perfume bottle and a Chinese handwarmer are paired with the bags they inspired. Contemporary artwork fostered another set of ingenious designs: A Mondrian bag features a primary palette with horizontal and vertical blocks of color. The Leibers nurtured each others’ repertoire and talents: A party scene that Gerson painted is playfully interpreted in one of her bags, showing a woman holding a drink. Her final handbag, a peacock-shaped minaudière created in 2004, captures her eye for elegance and beauty. Leiber’s numerous accolades include the 1973 Coty American Fashion Critics’ Award and the Lifetime Achievement Award from the Council of Fashion Designers of America in 1994. She is a Hadassah life member.